If you arrive in Crete by plane, you will either arrive at Chania Airport, in the northwest of Crete, or at Heraklion Airport, towards the northeast. Chania airport and harbour are more close to Sfakia, in the southwest. 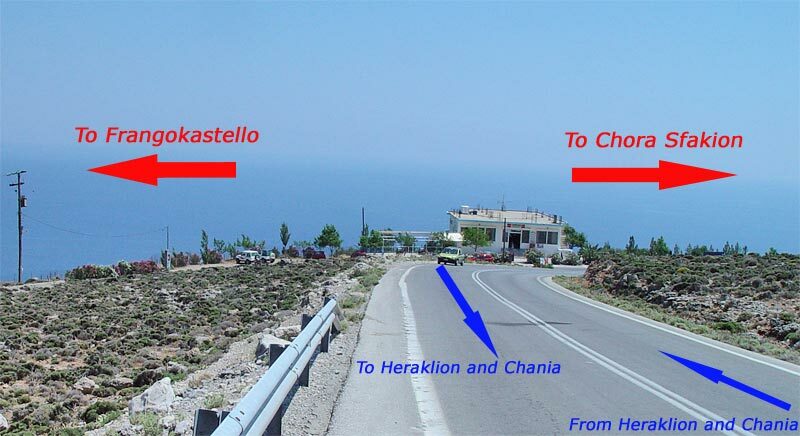 Road connections from Chania (top left) and Heraklion (top right) airports to Sfakia (down) through fork at Vryses. Click above image for full size. 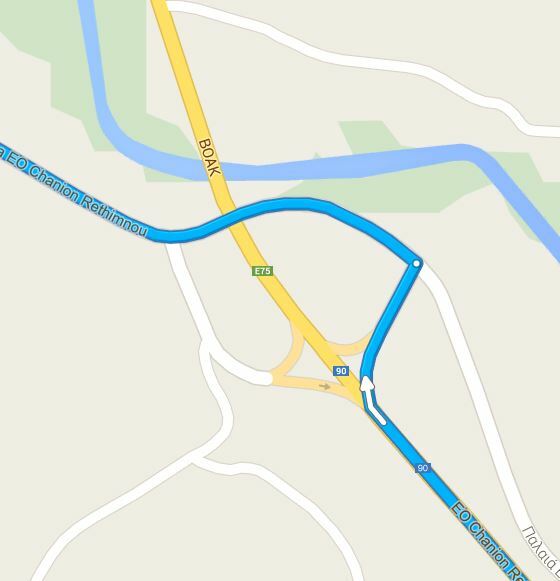 Drive out of the airport area, and follow the road south to Chania for about 7-8 km. Interactive map of Crete with driving directions from Chania airport towards Vrises (Vryses). You can zoom in and out, and get directions. 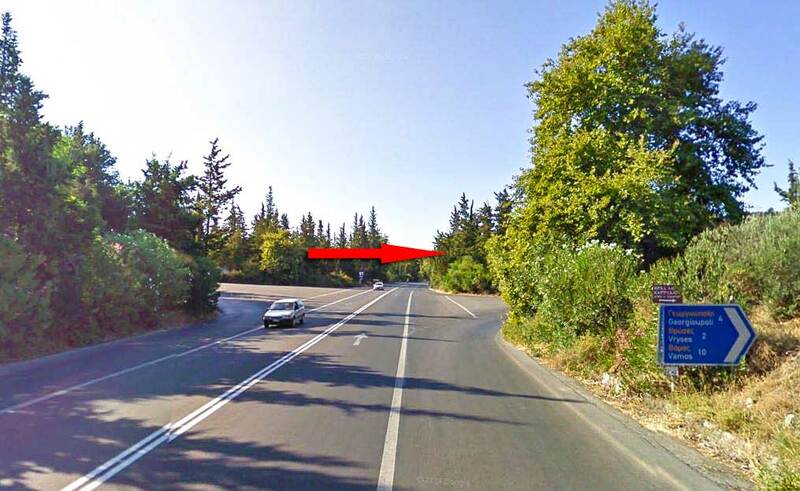 As you arrive at a roundabout with a Y fork on the opposite side, change direction, and take the left fork of the road, towards Souda Bay. 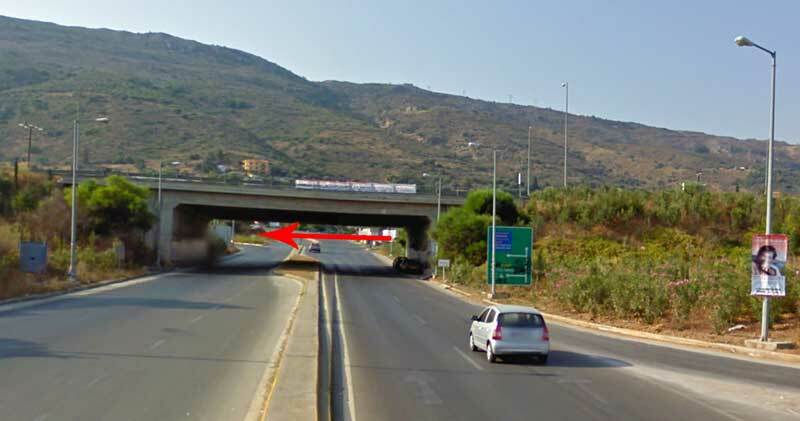 Follow the road until you pass under a fly-over, and turn directly left, following the signs left towards Rethymno. You will now drive on the National Highway for about 30 km towards Vrisses. 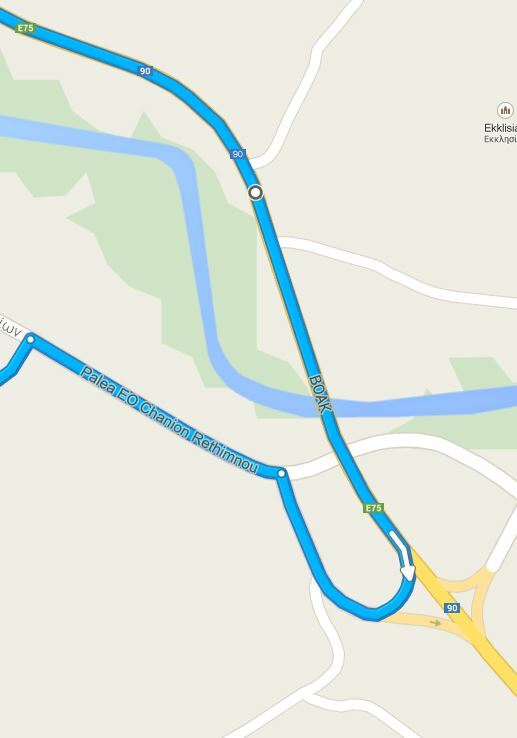 Directly after Vryses, leave the National Highway, and take the large fork to the right. Just follow this partly renovated country road for 40 km to Sfakia, through the mountains, passing the village of Vryses, and then through Krapi, Askyfou and Imbros (3 small tunnels), and then down the mountains again. As you reach the sea side, at a large white taverna at the left side of the road, turn right to Chora Sfakion, or left to Frangokastello. The whole drive is nearly 80 km long and takes about 90 minutes by car. Drive out of the airport area, to the exit of the National Highway. Turn right towards the west, stay on the National Highway for about 100 km, following the signs towards Rethymno, pass the city, and continue towards the villages of Kavros and Georgioupoli. 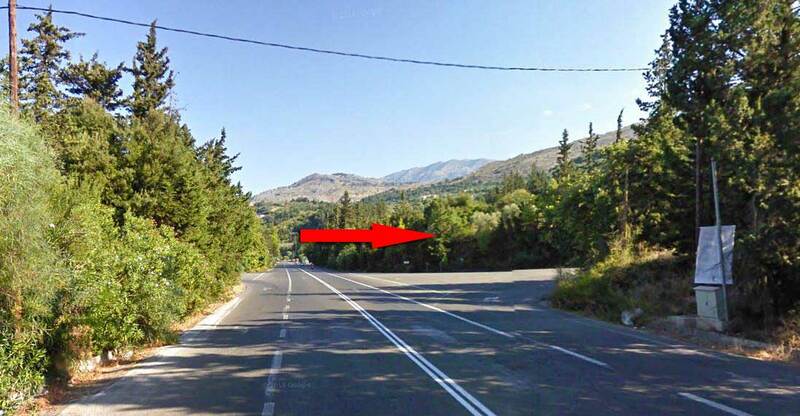 Just 3,4 km after Georgioupoli, take the fork at the right, leaving the National Highway. Follow the curved road to the left, passing under the National Highway through a fly-under, and continue on the partly renovated countryroad through the mountains to Sfakia for 40 km, through the mountains, passing the village of Vryses, and then through Krapi, Askyfou and Imbros (3 small tunnels), and then down the mountains again. The whole drive is nearly 145 km long and takes about 2½ hours by car. On Crete you can fairly comfortably travel by public bus. There are no trains in Crete, nor is there a railway system. Crete offers an extended grid of public bus routes. 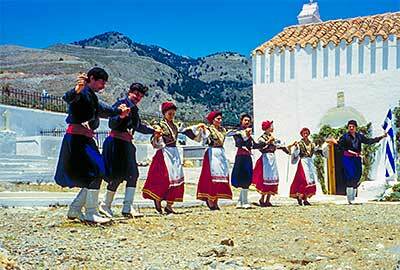 They are mainly operating to enable villagers to go to the cities in Crete. But they offer a cheap option to tourists as well, although the timetable is not designed to be of special service to tourists. Nevertheless you will often see tourists in the local buses on Crete, sometimes even mainly tourists. You need to study the grid, the connections, and the timetable to find your way with the bus in Crete. You can buy tickets at major bus stations, at kiosks, or otherwise in the bus itself. The Greek public bus company is called KTEL, the "Intercity Road Transport Companies in Greece". It is a cooperative company of local bus companies, established in 1952. Each individual bus is owned by one or more private persons, who themselves are responsible for maintaining and operatining the bus. After taxes its revenues are split amongst the shareholders. The planning of the timetable is done by the cooperation KTEL. KTEL has many offices all over Greece. On Crete public transport by bus is organised by KTEL West-Crete and KTEL East-Crete. From Chania to Chora Sfakion, Sfakia, there are direct buses. You do not have to switch bus. To reach us by bus from Heraklion (and Rethymno), you need to take a bus from Heraklion or Rethymno towards Chania, and change bus at the village of Vryses. There you switch bus, in order to join the Chania - Sfakia bus, passing through Vryses. Sfakia can be reached by ferry boat along the southwest coast of Crete, connecting the villages of Paleochora, Sougia, Agia Roumeli, Loutro and Chora Sfakion. From Paleochora and Chora Sfakion also the island of Gavdos can be reached. To avoid waiting times at Chania and Heraklion airports, and harbours, and for the best prices you can order a luxurious Mercedes Taxi or mini bus to bring you directly from the airports or harbours on Crete, or from your hotel elsewhere in Crete, to Chora Sfakion and surrounding villages and back. We will welcome you at the airport, just outside the room with the luggage belts, when you enter the main airport lounge, with your name on a board, if you pre-order our taxi together with your flight number and arrival details. 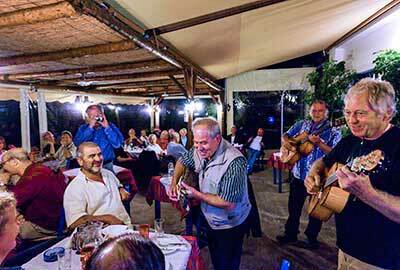 In 90 minutes from Chania airport or in 130 minutes from Heraklion airport you will be in Chora Sfakion very comfortably. Frangokastello is about 15 minutes longer. 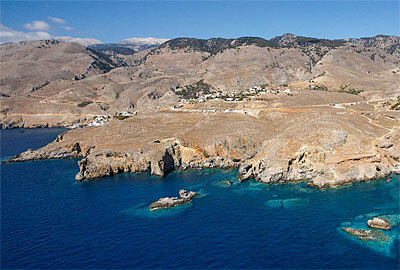 You can reach Sfakia by foot on the coastal path along the southwest coast of Crete. This path connects all the villages of Paleochora - Sougia - Agia Roumeli - Loutro and Chora Sfakion. To walk this path you need to be a quite experienced hiker! Your luggage can be transported by ferry while you walk. Contact the accommodation owner at your destination, and tell him with what ferry your luggage will arrive, and they will pick it up from the boat, and put it in the room you have reserved with them.